Have you ever forgot to open a new work recording in time? Read on for a new beta feature we just deployed. If you start a new work recording, it is sometimes really helpful to be able to move the start time of the current open work a few minutes because you forgot to start it in the first place. 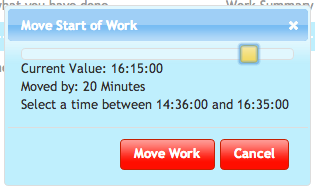 With this new feature you can move the start time - depending on the prior work - up to two hours into the past. We are still collecting feedback from users how useful this feature is and how to best integrate it into our user interface. So it is still a bit hidden. But you can simply click on the icon beside the "Current Work Time" to launch the new dialog.